For three consecutive days in November, the Seidenberg community got larger and more upbeat thanks to the visit of friends from places far away. 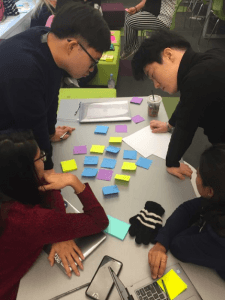 As part of its commitment to provide students with transformative experiences, and to grow innovative and responsible citizens, the New York City Design Factory (NYCDF) at Pace University partnered with Design Factory Korea (DFK) at Yonsei University to pilot a project-based learning experience around the Social Internet of Things (IoT) theme. 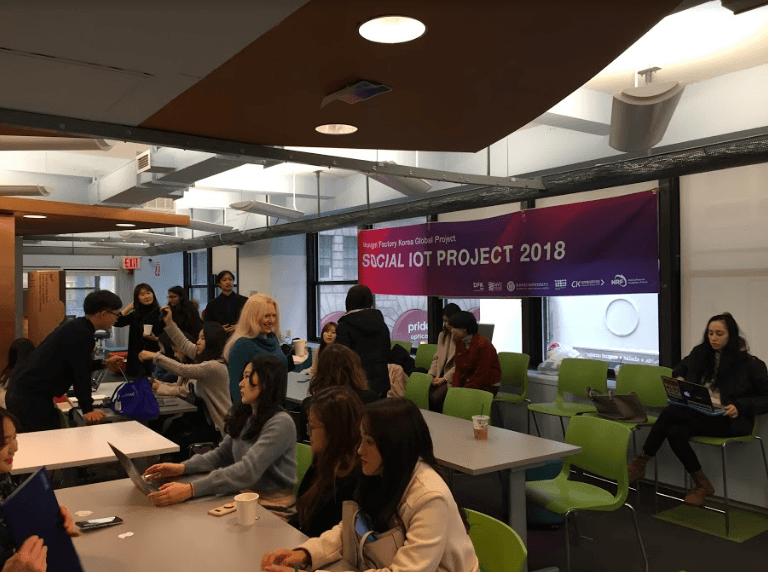 The Social IoT Project, led by DFK, aims to encourage students to understand IoT technologies and connect these technologies with UN Sustainable Development Goals. 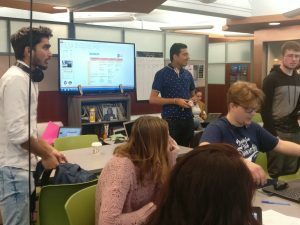 Through this project, students have an opportunity to strengthen their social entrepreneurial skills for the 21st century, including complex problem solving; critical thinking; creativity; and social innovation. 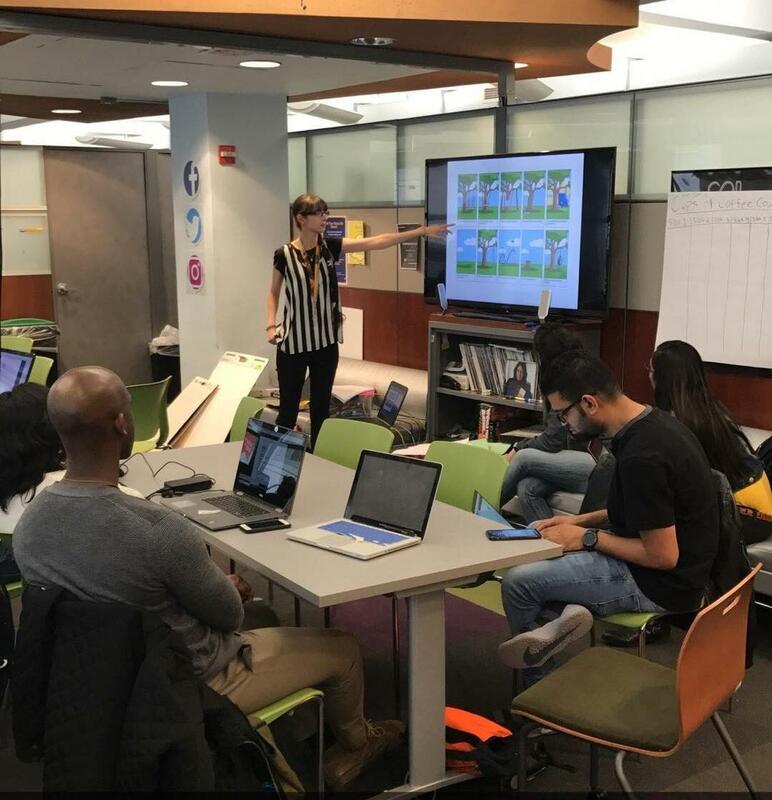 Students are encouraged to explore local interpretations of social issues, analyze and design an IoT based product or service, and validate and evaluate the social impact of its business model. 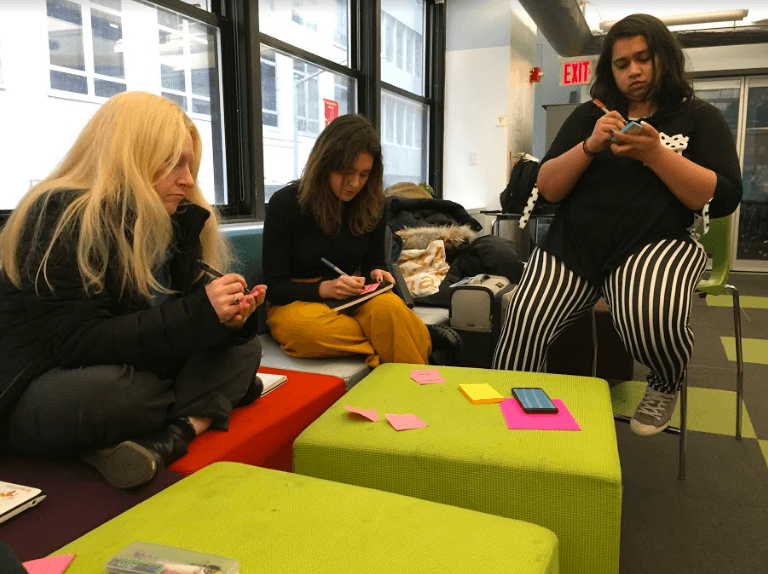 As part of the project, student teams at DFK and at the project partner institutions, including Pace University, engaged in specific courses/projects to address a social problem of their choice. 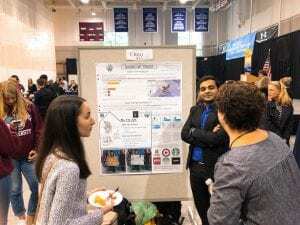 The solutions designed by the student teams, which aimed to integrate IoT or artificial intelligence components, were showcased as part of a gala which included project pitches and prototype demonstrations. 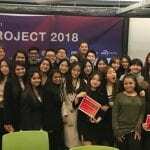 The Social IoT Student Gala featured 18 student teams from six design factories across the globe, for a total of 58 students! In addition to NYCDF (project host) and DFK (project lead), design factory (DF) and institution partners included: Aalto DF (Aalto University – Finland), Cali DF, DF Javeriana Bogota (Pontificia Universidad Javeriana – Colombia), and Fusion Point (Universitat Politecnica de Catalunya Barcelonatech – Barcelona). Teams were judged and awarded based on several different criteria. Here are the winners! An Innovation Development Workshop led by the DFK team offered students and faculty the opportunity to work together to further iterate on the solutions developed and presented as part of the Gala. For the workshop, teams from different design factories were paired based on common goals. 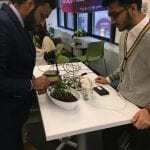 Two team pairs were recognized with the “Innovation Award” for their prototypes: AgriTech (NYCDF) & Smart Farmers (DFK), and Mirror Mirror on The Wall (NYCDF) & LIKA (DFK). 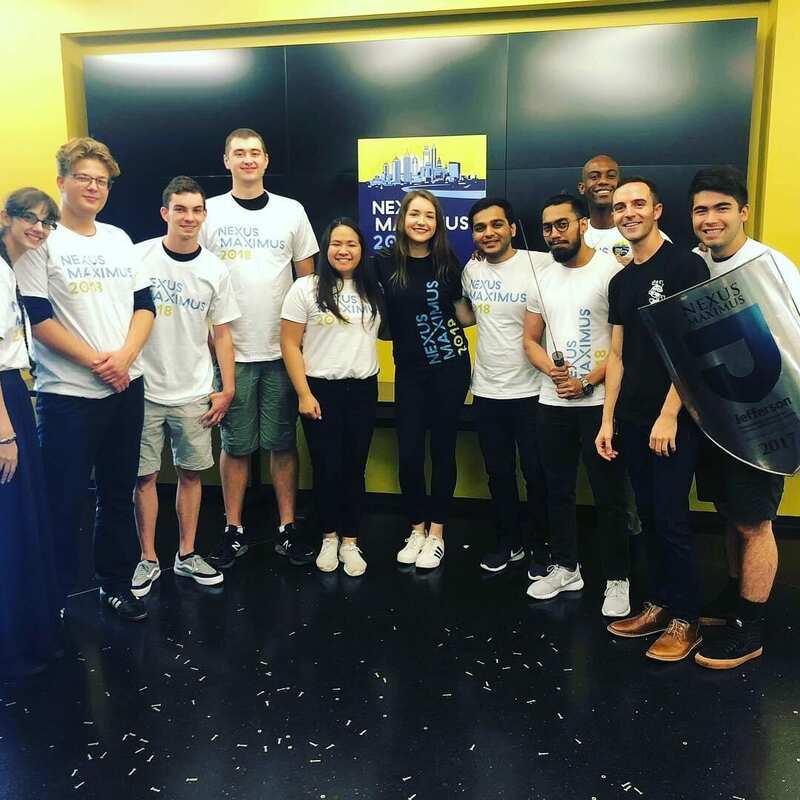 Last but not least, students and faculty were inspired by visits to NYC-based companies well-known for fostering innovation: SAP America, Intersection, Sidewalk Labs, Boston Consulting Group Digital Ventures and StackOverflow. 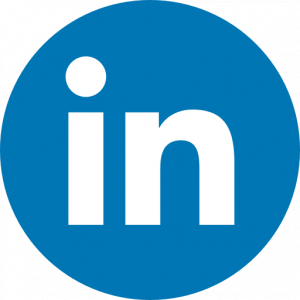 “Through projects like the Social IoT we aim to plant and nurture innovative thinkers. Students learn by doing and build skills for careers that do not exist yet. 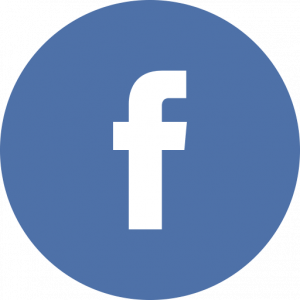 The conditions for this kind of learning could not be achieved without like-minded partners such as DFK, the DFGN community, as well as friends from academia and industry. I am grateful to all for their commitment to drive change through passion-based learning in an interdisciplinary, international context,” said Andreea Cotoranu, Assistant Dean for Academic Innovation and Director of the NYCDF. 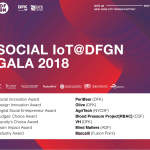 On this note, “gomabseubnida” (thank you) DFK, ADF, CDF, DFJB, Fusion Point and the bigger DFGN family for participating in the Social IoT pilot! We look forward to hosting the 2019 edition! Our thanks also go to Ursuline Foley, and Suresh Kumar (Seidenberg Advisory Board members), and John Lynn, Partner and Co-Founder of The Studio Project, and Seidenberg’s entrepreneur in residence. 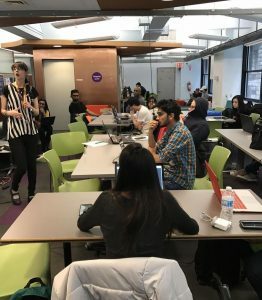 About: The NYCDF is a center for innovation and creative problem solving within the Seidenberg School of Computer Science and Information Systems at Pace University. NYCDF welcomes students of all majors, and across New York City and Westchester campuses! NYCDF’s most popular projects include courses like Product Development Project (PDP), Product Innovation Project (PIP), and Challenge Based Innovation (CBI). 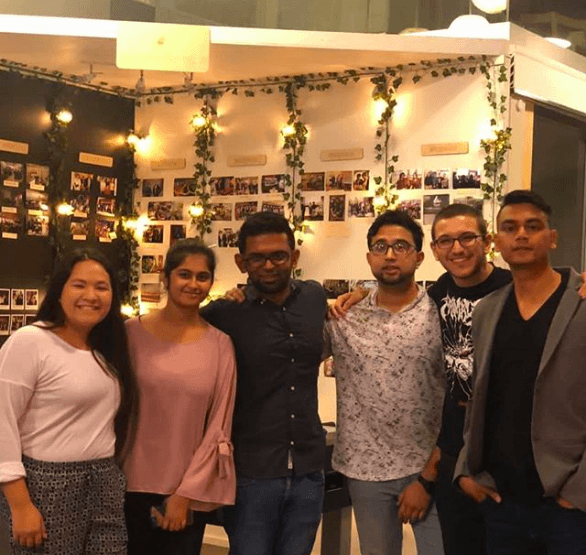 As part of these 7-month long experiences, students travel to Helsinki (Finland), Graz (Austria) and Geneva (Switzerland) to develop solutions for challenges presented by industry clients. 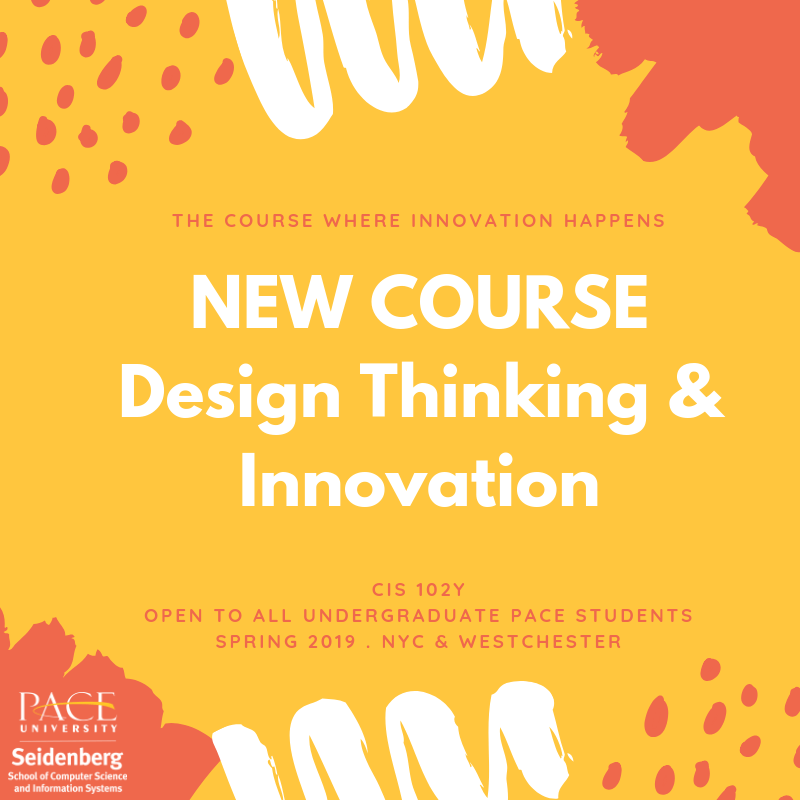 However, for students looking to understand what NYCDF is all about, check out CIS102Y Design Thinking and Innovation. 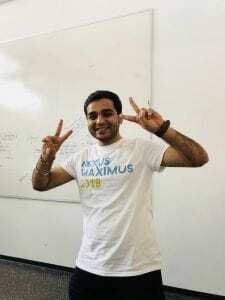 In addition to courses, the NYCDF supports other project-based experiences, such as the four-day Nexus Maximus or the 36-hour RAT Relay for Global Good, all designed to provide students with opportunities to learn by doing. Students interested in NYCDF experiences can contact Andreea Cotoranu at acotoranu@pace.edu. Woohoo! This semester’s Rat Relay was an enormous success! 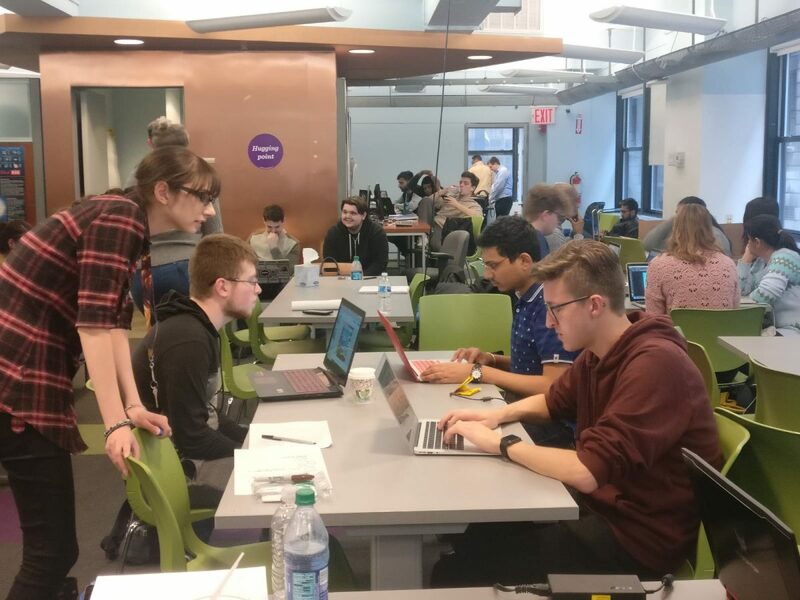 Students from Pace and other universities around the world participated in this exciting hackathon from March 20-23 across four days of innovation and design. 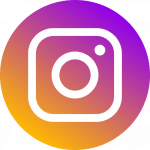 Rat Relay is a four day global design hackathon that is run by the Design Factory Global Network, of which our very own NYC Design Factory (NYCDF) is part. 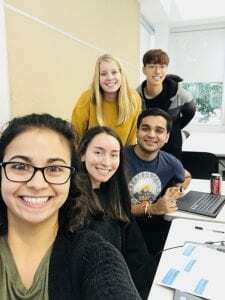 During the event, students from different parts of the world worked on real problems for NGOs, non-profits, or businesses located just about anywhere around the world. Nine Design Factories participated in the challenge, which are: NYCDF, Frisian Design Factory, Melbourne Design Factory, Aalto Design Factory, Porto Design Factory, Cali Design Factory, Bogota Design Factory, Warsaw Design Factory and Ghent Design Factory. Students worked together to define the problem a business may have, and came up with solutions through ideation, prototyping, and testing, before finally presenting their materials. 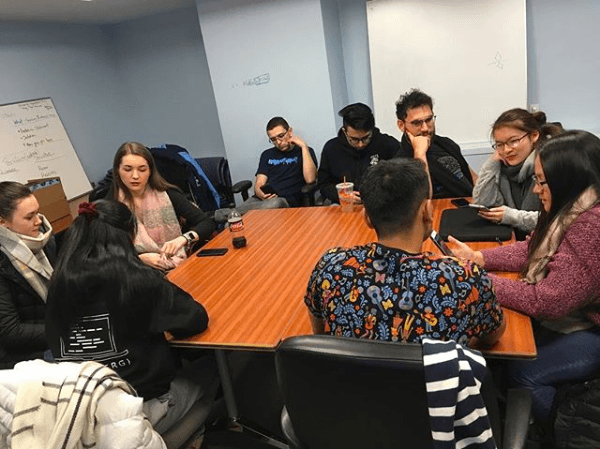 Rat Relay was held in the Seidenberg Lounge at 163 William Street (with students from other universities around the world participating digitally over Skype!). 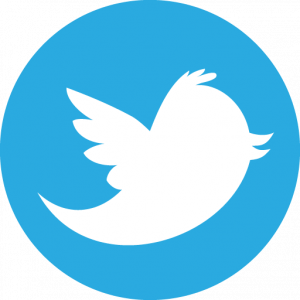 It was a 36 hour event, which was divided into separate slots of 6 hours each. It worked just like a relay – just as one member passes the baton to the next, participants worked on one aspect of the innovation for 6 hours and when time was up for one slot they handed off their project to another team from another part of the world. The new team then picked up the project where the previous team left off. It started with New York Design Factory. The innovation theme they worked on was EMPATHISE (Getting to know the user). The challenge: how to help students with autism learn how to self-advocate. The sponsors – Tech Kids Unlimited – had come and they spoke to the participants about autism in this slot. The project was handed off to Aalto Design Factory in slot 2. The aspect of innovation they worked on was REFRAME (Redefining the problem). The challenge they worked on: how to keep people involved in an environmental campaign. Frisian Design Factory worked in slot 3. The theme was IDEATION (Coming up with possible solutions). The challenge they worked on: what to do with the waste from natural disasters. The project went to Melbourne Design Factory for slot 4. The aspect of innovation they worked on was PROTOTYPE (Making designs for solutions). The challenge they worked on: home use for graphene floors. Cali Design Factory continued with project in slot 5. The aspect of innovation they worked on was TESTING (Testing the Prototype). 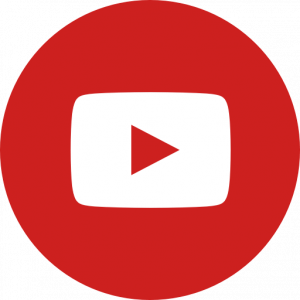 The challenge – how to stop kids from joining guerrilla gangs. By the end of the, the distributed team had come up with a solution: a mobile application named “SPEAK UP STREET”. This app teaches the students with autism how to speak up for themselves in real world situations. The app is designed as a game where users choose between a selection of responses to different types of situations. The app challenges users to play in in-game locations such as at home, at a friend’s house, school, and many other social places. When travelling to these locations, users will encounter various situations where they have to respond to a stimulus. Choosing the right option will explain to them why it is right and it will move them forward in the game. If they choose the wrong answer it will explain why it is wrong and ask them to choose something else or come back to it. It was wonderful to have such an energetic and enthusiastic event when students had just returned from their Spring Break! Hosted by Dr. Jaclyn Kopel, Director of the Pforzheimer Honors College and Interim Director of the NYCDF, each slot of this Rat Relay was packed with excitement. Participants really enjoyed working with people around the world, and there were 50 unique participants in total. 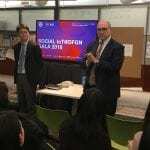 From Pace, both undergraduate and graduate students came from the Seidenberg School of CSIS, the Lubin School of Business, Dyson College of Arts and Science, the School of Education, and the Honors College. Getting real world experience working for international companies, working with innovation, improving one’s problem solving skills, and working in international, interdisciplinary teams is a hugely beneficial experience for students. Participants received a certificate saying they worked with 9 international companies and 8 countries. 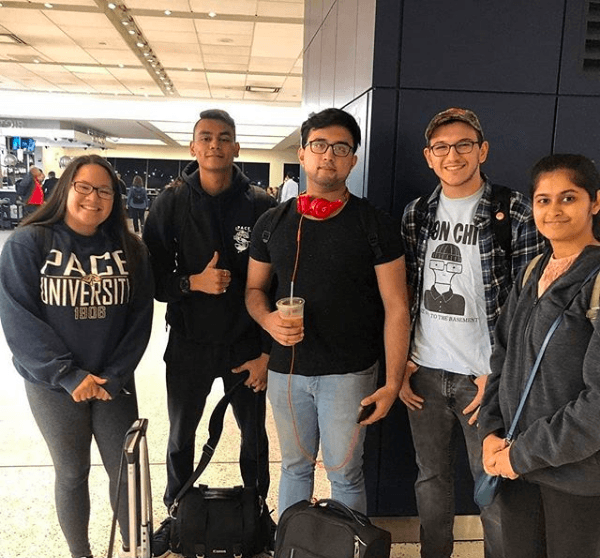 Freshmen and sophomores students had the advantage of getting on the NYCDF radar for the expanded versions that involved travel to other countries (Finland, Portugal, Poland, and Austria). As always, the Rat Relay was an exceptional event and we can’t wait for the next one in the fall!